Jessops stores in Birmingham, Clapham Junction and Colliers Wood, south London were attacked last night as riots spread across the UK. Initial reports suggest that the Birmingham city centre store was worst hit as looters smashed windows and ransacked the shop, according to the Birmingham Mail newspaper. The store, at Temple Row, was revamped earlier this year to become the retailer’s first Centre of Excellence. BBC reporter Grant Sherlock told the BBC News website that a group of youths broke through a metal security shutter, taking cameras and electrical equipment from inside. The flagship store opened in April, offering customers more than 300 cameras and lenses to ‘touch-and-try’. 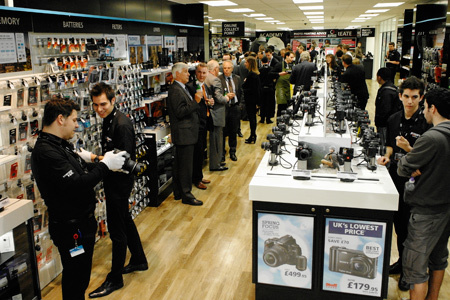 The 4000-square-foot outlet is trumpeted as the largest specialist camera store in the country, with ‘shops within a shop’ for brands such as Canon, Nikon and Sony. At the time of writing, police in Birmingham said they had arrested around 100 people in connection with ?large scale disorder? in the city. However, the full extent of the damage and looting remains unclear. A spokesman for West Midlands Police told us he did not have details of damage caused to ‘individual shops’. Jessops chief executive Trevor Moore said in a statement: ?Our business, like that of most other high street retailers, has been impacted by the rioting and demonstrations that have taken place and we have been working closely with the police and local authorities? to minimise the risk to our customers, colleagues and to limit the damage to our premises and our exposure to theft.? Moore said he was not in a position to discuss details of the firm?s plans, or of ?any losses that may have occurred?. He added: ?What I can say is that the Jessops team are proactively managing the situation and ensuring that the most appropriate action is taken during this difficult time.? Moore declined to comment further. Jessops, which is Britain’s largest retail photographic chain, is based in Leicester. Meanwhile, fire broke out at a Sony distribution warehouse in Enfeld, north London at around 11.30pm last night. There were no reported injuries but it is understood there has been damage to recording media such as DVDs and blank CDs. In a statement issued this lunchtime, Sony said that the fire was ‘under control’ and ‘smouldering’. ‘We are unable to confirm the extent of the damage or the cause until the fire is fully extinguished and a full investigation can be carried out by the authorities,’ said a spokesman. 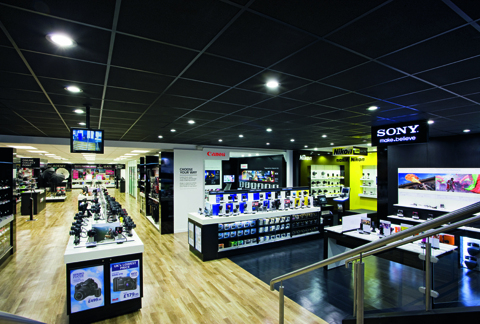 Run by the Digital Audio Disc Corporation, a subsidiary of Sony, the centre distributes products such movies, music and games to stores around the UK. More than 450 people were arrested in London over three nights of violence across the capital, according to the Metropolitan Police. A press photographer was ?dragged to the ground by four youths and beaten? during riots in Hackney, London, according to a message posted by Guardian journalist Paul Lewis on Twitter. Lewis added: ‘People taking pictures at Pembury Estate accused of being police. Volatile situation’. A separate eyewitness told Sky News he had seen a photographer have a camera ?ripped of them? during the early evening. Two press photographers were attacked as they attempted to document the violence in Clarence Road, Hackney, according to a Daily Telegraph reporter at the scene (it is unclear whether this is the same incident).